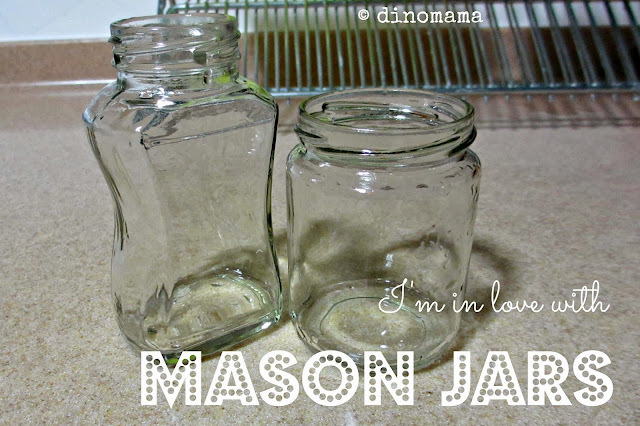 I love Mason Jars, do you love them too? Whenever I throw away an empty mason jar I always feel that its such a waste as they look perfectly good to be recycled again. However, more often then not I did not keep them because I couldn't think of any other use for them except to keep some loose coins or small knick knacks. Then there is the issue of removing those labels completely, no matter what I do, I simply cannot remove the stubborn glue from the jar. These glue stains some how makes the jar looks "imperfect" and as time goes by dust will be stuck to it turning them into an even uglier sight. Recently I found out there are many people who love mason jars! They shared many great ideas and ways to use these jars, even tips on getting the labels off the jars with minimum scrubbing or trouble. I went through all the tips and decided to try the simplest tip that does not involve any hard work. Bring a pot of water to boil, remove from fire, squirt some dish washer into it, swirl the pot around to mix them up (see, I'm even lazy to take a spoon to stir them), drop the jars in and leave them at the kitchen sink. Ensure that the soapy water covers the label so that it can work on every part of the labels. About 15 mins later, you should see part or whole the label has fallen off the jar. I simply remove the labels and rinse the jars with water. There were no glue stain on the jars too! The soapy water even makes getting rid of the ink stamped on the jar an easy task with light scrubbing of the green scrubby thingy. 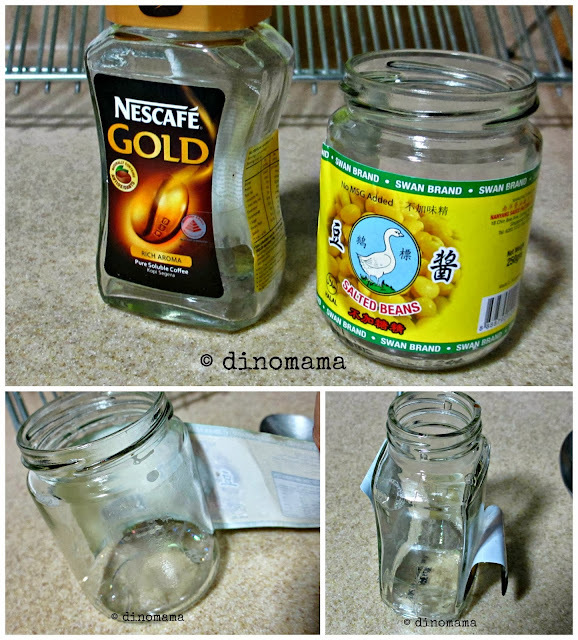 If you are a Mason Jar fan too, please share with me what do you use your jars for. They look fabulous! Maybe you could turn them into flower vase? That's one of the idea. I recycle these glass jars too! Useful for nuts that I buy in bulk, or homemade toasted muesli, or flour if the jars are big enough, or sugar, etc. Possibilities are endless! I won't but not sure if DinoPapa will or not hahaha~ Ya I was thinking of washi taped them too since I bought a few rolls recently during the Popular sale. You could always make home-made jams or muselis and give them as gifts with a beautiful printed out tag. I'm planning to do that for my son's teachers for teachers' day next year. I need to do this - thanks!